When the Germans were planning for the Ardennes offensive (later known as the Battle of the Bulge), part of their plans centered on the use of captured American vehicles. Unfortunately there were never enough of these around so the Germans resorted to the next best thing: modifying their own vehicles to look like Allied vehicles. The best known examples of these are the modification of the Panther to look like an M10 and the modification of the StuG III to look like... well, I don't know exactly. The best online source to find all the known pictures of the "Ersatz M10" can be found in . The model comes in a plastic bag inside a sturdy, top opening cardboard box. No parts were found broken upon opening. other missing or incorrect details mentioned in the review of the Dragon kit. Some other mistakes present in the Dragon kit were left untouched, however. More about that when we come to the construction of this kit. Instructions are not included, which is a weak point of Cpl Overby's Motorpool's kits. Pictures can be found on the Facebook page of the manufacturer however, which might not be to the liking of people without a Facebook account themselves. Casting quality is mainly very good, with crisp detail; a case in point being the very thin grab handle at the rear of the turret. (I wonder how this gets cast without being broken.) There are very few air bubbles and very little warping. Pour plugs are sensibly placed. Warping was found in the rear upper hull plate, but this is rather easy to correct. Note that the original "disguise" was made of some very thin metal sheet which got easily deformed itself, so you might actually leave it be. One thing that is annoying is the casting deficiency on the sides of the turret. There is a positive ridge on the right side and a negative on the left, as if the molds had shifted. Sanding and a layer of putty will rectify this, as they are not interfering with any detail so nothing will get lost, but it is a bit disappointing nevertheless. I also noticed that the rear lower plate of the turret has two ejection marks. I don't know of the use of ejectors when casting resin kits, so I can only assume these were present in the Dragon kits on which this conversion set is based. With all the work that has gone into detailing and improving that kit, these two depressions might easily have been taken care of as well. The kit comes with other parts that - to my naked eye - are similar to the Dragon "Ersatz M10". This is actually a good thing, as the correction set can now be used to convert any of the first generation Dragon Panther or Jagdpanther kits to an Ersatz M10 without actually needing the newer Dragon Ersatz M10 (except perhaps for the decals - more about that later). As the older Panthers can be had rather cheaply, but the new Ersatz M10 is rather expensive (at least where I live), this means that it now actually makes economic sense to buy an older Dragon Panther kit and combine it with this set to obtain an Ersatz M10 that is competitive in price with the Dragon Ersatz M10 but with better detail. As an added bonus you will get plenty of spare parts from that older Dragon kit which you could put to good use elsewhere. This resin set also comes with a gun barrel. While it is as good as that in the Dragon kit, I wonder why it is actually needed as you will get one from the donor kit, unless you start from a Jagdpanther kit of course, which I did. My starting point was the Dragon "Early" Jagdpanther (kit 7241), reviewed here and here. Construction showed that the resin behaves almost as plastic when sanding and cutting, which is nice, even though you still need superglue to assemble. I opened up all hatches and openings by removing the thin casting film. Afterwards I decided to build the kit with all hatches closed and blanked of the engine intakes from below, so I really shouldn't have bothered. I drilled out the exhausts. The holes under the sponsons (meant to hold the Schürzen in the donor kit) were filled in. The solid center of the towing pintle was removed and replaced with a rod. The rear antenna pot was cut lower and drilled out. It seems no antenna could be fitted due to the turret overhang and available photographic material doesn't allow me to tell if it had been repositioned. The solid handles were either hollowed out or replaced with thin wire. Construction started by mating the turret bottom to the turret front. I originally planned on using the engine insert from the Dragon kit, but didn't in the end. The resin rear was mated to the plastic lower hull, revealing a gap. ... as well as on the tow coupling. The latter was later hollowed out and the transversal bar replaced with rod. These openings are meant to hold Schürzen, which aren't used in this kit and were thus filled in. The antenna mounting was lowered and hollowed out. It seems no antenna could be fitted to the Ersatz M10 due to the turret overhang. and fitted to the hull. While the Cpl Overby set corrects quite a number of errors present in the Dragon kit, one annoying blooper wasn't. The Dragon kit has a glacis that slopes a bit too much and the Cpl Overby parts have the same slope. While the slope itself isn't a problem whatsoever, it does create a strange situation at the tip of the nose, leaving a gap on the sides where the towing eyes need to come and creating an upper "lip" that is exaggerated compared to the real thing. The top side extensions where the towing eyes fit onto are flush with the glacis in the kit, but sat proud in the real vehicle. Furthermore, the lip is too wide, making it impossible to fit the towing eyes. The resin part for the M10 conversion was too narrow for the Dragon hull. I am not sure if this is because I started from the Jagdpanther, but adding spacers to the sides wasn't that hard. The upper glacis plate presents a lip, which is too pronounced, while the sides show a gap. This is also present in the original Dragon M10 kit. Note that the real vehicles could be fitted with a blanking plate over the opening for the hull MG, which is not included in the kit but very easy to make from a piece of sheet plastic. The cover for the driver's periscope that the kit provides was apparently not fitted to the real vehicles. 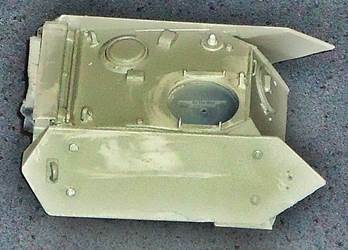 The intakes in the Jagdpanther kit are larger than in the Dragon Ersatz M10 (doubtful). 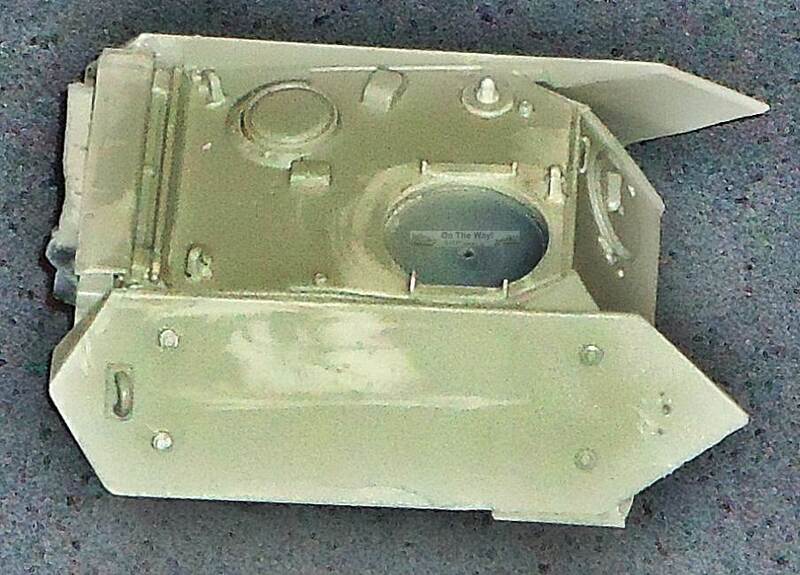 The intakes in the Jagdpanther kit are larger than in the Cpl Overby Ersatz M10 parts (possible to a slight shrinkage of the resin when curing). An omission to the Cpl Overby kit are the three supporting rods that held the turret disguise in place. One remnant of such a rod can still be seen on the top of the turret piece. As it doesn't go all the way to the sides it is better removed and replaced with a new, continuous rod. Note that Cpl Overby gives us the possibility to open up the turret hatches, but didn't provide any detail to the inside of those hatches. While the barrel that comes with the kit is good enough, I still decided to replace it with a gun barrel from RB Model (set 72B07). The fenders need to be thinned to allow the tracks to pass. It would have been easier if I had done this earlier. 3 types of exhaust are included: unshrouded (with extra cooling pipes), shrouded and with Flammentöter. Nice for the spares box. There is a second set of identical (?) sprockets included but not shown on the parts lay-out. Strangely, there are more spare Jagdpanther parts in the Dragon Panther kit than in this Jagdpanther kit. The two halves of the idler are marked A6 in the instructions even though both halves are not identical. The two halves of the center wheels are marked A1 in the instructions even though both halves are not identical. The tracks are too short, which is a real let-down. As you can read here, it is a recurring problem. Trying to stretch them is bound to get you into trouble as you can read here. The leftovers if you start from the Dragon Jagdpanther. Not only is it cheaper to start from this kit, but your spares box will be happy as well. At the time of writing Cpl Overby has started to release this kit with decals for three vehicles: B4, B7 and B10. 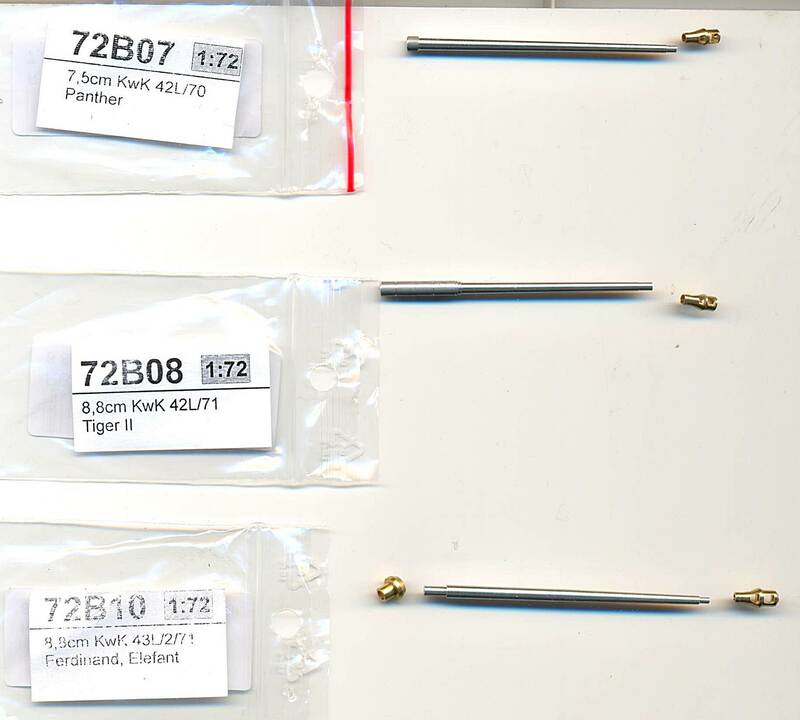 Of course, people starting from the Dragon M10 will not need these, but it will allow the modeler to start from any Dragon Panther or Jagdpanther kit. The best source for info on the Ersatz M10 can be found in . A brief summary is presented here. B10. This is the one that got stuck in a house with its gun. I decided to build mine as "B4" with the ultimate aim of putting it in a diorama in which the Germans were hiding the vehicle as best they could from prying eyes. For that I partially covered the vehicle with tarps, but as I didn't want to hide the decals completely, I went with the idea that the crew was rather sloppy in their work, so I could at least show part of them. The tarps were made according to a technique described here. The (almost) finished model. Areas where the paint keeps rubbing off will only be touched up when the vehicle is in its diorama. Sample kit bought by author with permission of his wife.